Our love for Thailand is nothing new. And Bangkok has a special place in our hearts and tons of photos on our Instagram account. It’s easy to explain, the city has numerous places for great photography. So if you love Thailand or love taking photos, this post is for you: photo ideas and the most Instagrammable places in Bangkok. We have been in and out Thailand several times. And after writing three super guides about Bangkok [Travel Guide to Bangkok for first-time travelers, romantic Bangkok for couples, and Unique Things to do in Bangkok], we decided it was time to share our favorite spots for Instagram in Bangkok. Bangkok is described as a city where you live fast, eat amazing food, enjoy exciting nightlife and admire a number of extraordinary attractions. It was once called the Venice of the East, thanks to the numerous canals intersecting over the entire city. Today, there are only a few left to remind of the history and tradition of the locals. The city is known as a place where the past meets future. Don’t be surprised when you see a cityscape full of splendiferous temples and stunning skyscrapers, that’s Bangkok. Bearing in mind that the Thai capital abounds in interesting and amazing places for any visitor. It doesn’t take a lot of time and effort to find some of the most picturesque and incredible places worth an Instagram photo. Here are a few suggestions, just to help you start your photo shooting in Bangkok. When talking about markets and shops, people instantly picture an air-conditioned complex or flea markets. However, what rarely crosses one’s mind are floating markets and that is exactly what you will find in Bangkok. During centuries, most of the communities in Thailand were formed on river shores. Transportation of people and goods brought those communities together, creating this unique phenomenon of floating markets. It is once in a lifetime experience to merge with the locals, feel the specific charisma they refuse to lose, despite the rapid development of the urban life. The richness and colorfulness of the markets and interaction with the locals is a priceless experience and a great opportunity to snap a perfect photo. Our photo advice: smile to people, try the local food and then take your photo. This way you get a better connection with the place and the people, that will show on your Instagram in Bangkok! And Klong Lat Mayon is our favorite floating Market. We did an amazing tour with TakeMeTour, explored Klong Lat Mayon, visited a local temple and learned how to cook Pad Thai. It was an incredible day! The Chinatown is one of the oldest parts of the city and during the day it doesn’t differ much from every other site of Bangkok. Numerous alleys are crowded with little shops where you can find all kinds of stuff. But, after the sun goes down, this place turns into a paradise for food lovers with stands offering all kind of specialties. From Chinese noodles and soups to fried ice cream. The atmosphere is incredible and the neon signs will make you feel like you’re in Hong Kong [minus the skyscrapers, plus the lovely Thai smile]. It’s a great opportunity to enjoy the ultimate foodie experience and snap some cool photos. Our photo advice: get lost in the tiny alleys for unique opportunities for your Instagram in Bangkok. And don’t forget to try the traditional desserts. The beautiful complex with golden peaks, over 200 years old, is probably the most famous attraction of Bangkok. The history and grandiosity of this place are hard to describe; you have to experience it. From 1782 it was the formal residence of Thai Kings and it treasures so much of history and tradition, worth admiring. You will have to spend at least half of a day to see everything in the palace. Prepare your camera for stunning statues, amazing buildings, and outstanding details. Our photo advice: the Grand Palace is a religious and governmental building, you must show respect. Forget all the crazy Instagram poses and you must be dressed appropriately. Take this photo experience to a different level, working your skills to capture real life moments and details. Accommodation in Bangkok is not hard to find, hotels and hostels are everywhere. The best thing is that you can find amazing luxurious 5-star hotels with a dozen of amenities and facilities for an incredible price range. 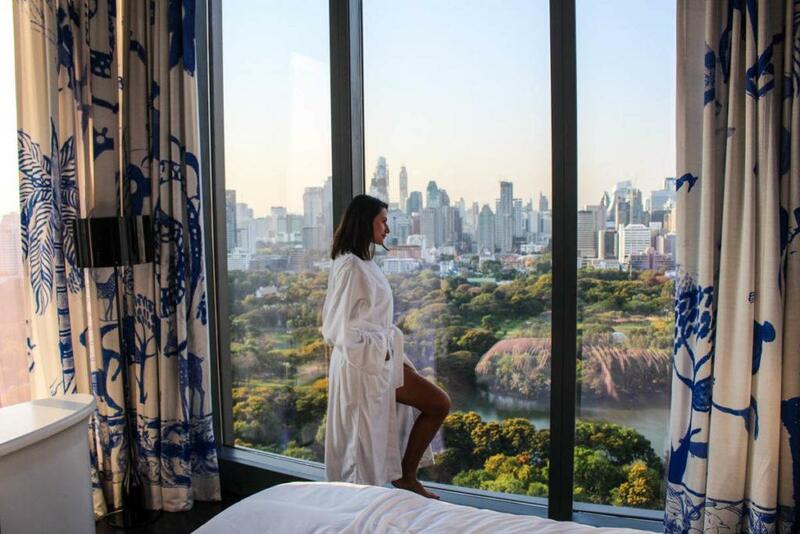 Taking into consideration that Bangkok today is one of the most popular cities in the world, you will be stunned with the great value for money accommodation is there. Most of the beautiful hotels that offer astonishing views with high-class service and comfortable bedrooms can be booked for almost the same price of some mid-class hotels in other world capitals. Our photo advice: after booking your room send an email to the property asking if you can get a room with a nice view. Also, before booking check out the photos of the hotel to see if there is a rooftop pool if there is a rooftop bar or even both. 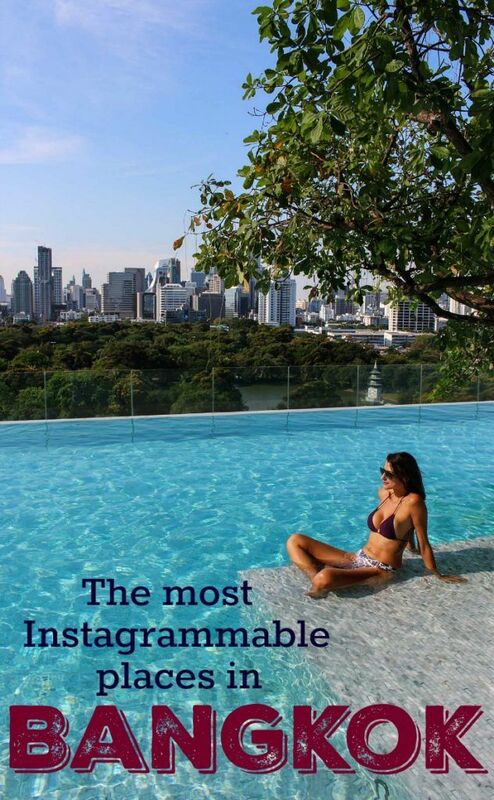 So you know you can have endless possibilities for Instagram in Bangkok. The first thing that catches your eye once you enter this magnificent temple is the grandiose, golden statue of the Reclining Buddha. The calmness and beauty that you experience here is something that will stay with you. The temple itself is older than the city of Bangkok and represents one of the most valuable and most important shrines in Thailand. However, the statue of Buddha is not the only thing that you can take a photo of; there are hundreds of details that look amazing and are totally worth snapping a couple of photos. Our photo advice: we have been in Wat Pho 3 times and we can’t get enough of its beauty. My suggestion is to walk around and discover the hidden corridors, small details that can work on a perfect shot. Again, this is a religious place, don’t even try any weird pose, cover your shoulders and knees. There is no chance to stay hungry in Thailand. As soon as you arrive in Bangkok, the aromas and spices will hit you and awake all your senses. You just can’t resist the Thai cuisine and no matter where you try it, you won’t be sorry. You don’t have to go to some fancy restaurant to enjoy the real Thai cuisine. Among travelers, the street food is a popular attraction and a good source for beautiful Instagrams in Bangkok. There are stands in every corner and not just that, they have wheels too; so, let’s put it this way – they are inevitable! It would be a total waste not to take a photo of the delicious Thai food, even if it’s just to make other people craving for it! Our photo advice: not all Thai food is photogenic, some of them taste damn good but look a bit weird. My best bet for Instagram food shots are the bowls of soup, Pad Thai and the fruits, they are delicious and so colorful. Bangkok is famous for its high rooftops, great viewpoints and local architecture that will not leave anyone indifferent. By day or by night, the skyline of the Thai capital looks amazing and it would be a real shame not to capture all that beauty in a few photos. Whether you’re an experienced photographer or an amateur impressed with photography, you won’t have many struggles in finding your perfect place for the skyline photos. There are dozens of great places from where you can take your pics and enjoy the extraordinary view. Our photo advice: night shots are so hard to do if you really want to work on a nice long exposure the best bet is to go to a rooftop bar or from the hotel window. if you have a nice view, of course. For professional looking Instagram photos a tripod for night shooting is a must. We did ours with my mobile phone [Huawei P9] on free hand, quite a good job as we were so excited with the moment and didn’t have the proper setting for a super sharp Instagram photo. Markets in Bangkok offer about anything you can imagine; from things, you can use in everyday life, fresh food and other agricultural produce. Also, things that you have never heard of and don’t know what they serve for. This chaotic shopping experience is something you must see. Hundreds of meters of alleys with colorful stands, people buzzing all around the place and bargaining with the sellers. Markets are the perfect place to catch a photo of spontaneous everyday life. Our photo advice: the famous Chatuchak Market is the first market option for travelers. It’s huge, you can get lost inside, but it’s not the only photographic spot in Bangkok. Almost every neighborhood has its own fresh market full of character and local people. Once you go off the beaten path you get the chance not only to take unique photos but also experience unique moments. This enchanting place lies just a few miles from Bangkok’s busy area, it is a total opposite to city’s noise, crowds, and pollution. The so-called “green lungs” of Bangkok is a peaceful green oasis, perfect for a little getaway where you can enjoy miles of hiking treks and bike trails. Surrounded by beautiful nature and amazing temples; it is so tucked away from the city that you would never guess what lies outside this jungle, on the other side of the river. Bang Krachao is an island in the middle of Chaopraya River, people go by ferries and once you arrive in the island you can rent a bike and cycle around. Don’t you miss to pay a visit to this green paradise and keep in mind, nature is the greatest artist and you should enjoy its masterpiece. Our photo advice: Don’t be afraid to get lost on the island, stop by the ancient temples and the local eateries. In every corner you can find a photo opportunity. Another green spot of Bangkok, this beautiful park is located in central Bangkok. It can be easily compared to world’s most famous parks like Central Park in New York or Hyde Park in London. Lumpini Park was named after Buddha’s birthplace in Nepal and represents a popular public space for both locals and visitors. However, Lumpini Park is not near a dull, boring place where you just sit and do nothing. It offers dozens of activities like running, boat-renting, dancing classes, open-air gym, fitness groups and much, much more. It’s a great place to enjoy yourself and engage in different activities, including taking photos. Our photo advice: for us Lumpini is the perfect place for romantic photos. You can ask other people to take your photo [Thai people is really good on it], or you can use a tripod and work in some really lovely Instagram shots. Hope you liked our tips to find the best place for Instagram in Bangkok. This is just a few awesome places in the city. Many people asked us if Bangkok is safe for crying your camera and tripod around, and my answer is yes! I’m sure after your trip to Bangkok and Thailand you will have tons of amazing photos to share not only on Instagram but with your friends and family. Is this your first trip to Bangkok? Don’t miss our super guide for your first time in Bangkok. If you have been to Bangkok before check our guide to unique things to do in Bangkok. And you can also find much more travel tips to Thailand here! Happy Travel and Photos! This makes me miss Bangkok so much! Great photos.